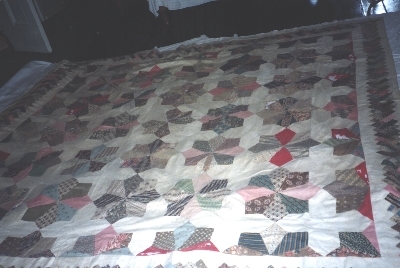 Patchwork top made of cottons, constructed with 5 by 5 rows of squared 8 point pieced stars alternating with white cross-shaped blocks (made from 4 pieces). On all sides are borders of half stars. The outer border is of rectangles of cotton prints appliquéd on to cotton to form a plaited pattern. The border only is backed with a band of cream cotton. All patches are whip stitched together.